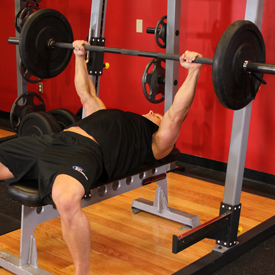 1 .Secure your legs at the end of the decline bench and slowly lay down on the bench. you have a spotter help you lift the barbell off the rack. 4. Using the triceps to push the bar back up, press it back to the starting position as you exhale. forehead. Breathe in as you perform this portion of the movement. 6. Lift the bar back to the starting position by contracting the triceps and exhaling. 7. Repeat steps 3-6 until the recommended amount of repetitions is performed. Variations: You can use an e-z bar or dumbbells to perform this movement. 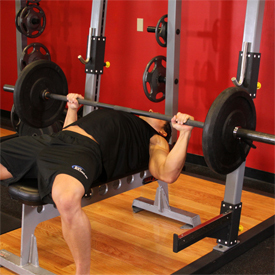 You can also perform it on a flat bench as well.